Another 26 wins & 65 nominations. Lucas may have problems as a director and writer, but I've always thought that those flaws are balanced by his great storytelling ability. The problem with "The Phantom Menace" is that he simply has no story to tell. The film merely adds an introductory chapter to a story that has already been told, and stretches it out into a two-hour movie. It is no accident that prequels of this kind are rare. They are very difficult to make properly. And apparently he's just not a sophisticated enough filmmaker to pull it off. For one thing, this project is limited by the fact that anyone familiar with the first trilogy knows the story's outcome, and it therefore lacks some of the suspense associated with a gradually unfolding saga. More importantly, however, this situation leaves Lucas with very little freedom as a storyteller. It also encourages him to gloss over key events; because their outcome is a foregone conclusion, he forgets to bring them to life. For example, we know there will eventually be a romance between Anakin and Padme. So Lucas has the two characters meet here and--surprise, surprise--they seem to like each other. Their developing friendship isn't portrayed that clearly, and their motivations for becoming close aren't explained. Because Lucas fails to make scenes like these believable, we can't help being conscious of how he's manipulating the plot in his effort to connect the two trilogies. Another good example of this problem is Anakin's portrayal as a potential Jedi. There doesn't appear to be anything about this kid remotely out of the ordinary, even though the other characters keep talking like there is. Our only reason for thinking he's special is that the plot requires it. If the story fails to be engaging, it is because we never see the important events. Lucas makes a fatal error in not showing what's happening on Naboo, the small planet whose capture is the focus of the plot. Numerous atrocities are supposedly being committed against the planet's inhabitants, but we only know about this because the characters on screen refer to the events, usually rather woodenly. The deadpan performances are a problem in themselves, but they only highlight our lack of involvement in the story. Think of Han Solo sweating in fear, then think of the emotional vacuums passing for characters in this film. Whenever any of the characters do express emotion, as in the scene where Anakin and his mom part, it still seems awfully restrained. Somehow, Lucas manages to keep the emotional reactions of his characters to a minimum, which gives the film an almost mechanical feel. It's true that "A New Hope" never showed Alderaan's inhabitants, but we still could feel the tragedy of the planet's destruction through the horrified reactions of Princess Leia and Obi Wan. Moreover, there were many other involving events which we witnessed directly, such as the slaying of rebels at the beginning; the capture and torture of the princess; and the murder of Luke's foster parents. Furthermore, the major plot elements were intriguing in and of themselves. They weren't there merely to show us how they were to be linked to later events, which seems to be the case with the new film. I suspect that Lucas was not as concerned in the first trilogy with what had to happen later in the story and was therefore able to focus his attention on the events at hand. The weakest segment was "Return of the Jedi," which had the task of bringing the story to an end. Only then did Lucas start to show signs of forcing plot points. 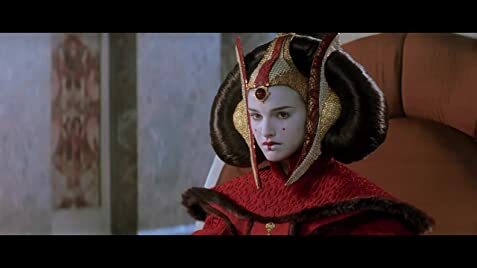 In "The Phantom Menace," he gets so bogged down in the task of bringing his story from point A to point B that he ends up with only the bare bones of a plot, and none of it comes alive. This is especially true of the characterization. In the old trilogy, characters like Yoda and Han reveal distinct personalities in their first few minutes on screen. This film goes for more than two hours and the characters, including the familiar ones, come off vague and nondescript. We aren't given much of a chance to experience their personalities in the way they interact. We must take Qui Gon's word for it when he describes Obi Wan as "headstrong." What's most odd is that the cartoons seem better developed than the humans. The scenes where Qui Gon negotiates with the birdlike slave-owner Watto are amusing and well-done--probably the movie's best scenes aside from the stunning action sequences--but they can't hold a candle to the constant interactions throughout the first trilogy. One thing I cannot do is accuse the film of lacking creativity. The design of the creatures, the technologies, and the planets is impressive. Watching the film is sort of like reading a children's book that isn't very good but abounds with beautiful illustrations. There is certainly a "wow" factor in the movie's visuals, but the effect of it is short-lived. I get irked when I hear fans talk as though the "Star Wars" movies were never about anything beyond special effects. While the inventive visuals are part of what made the originals so revolutionary, they're not what made the films so fun to watch. And in no way can they explain the trilogy's continuing popularity today. After all, many of the original effects look primitive by today's standards, and their novelty has certainly worn off. Only an enduring and compelling storyline could have allowed the first three films to become the classics they're almost universally acknowledged to be. The Hutt behind Jabba during the podrace is Gardulla the Hutt, the original owner of Shmi and Anakin before losing them to Watto in a bet. She later appeared in Star Wars: The Clone Wars: Hunt for Ziro (2010). Republic Cruiser Captain: With all due respect, the ambassadors for the Supreme Chancellor wish to board immediately. After Daultay Dofine's first line of dialogue ("I knew it! They're here to force a settlement! "), he and Rune Haako switch voices. For the rest of the film, Haako speaks with Dofine's voice, and vice versa. Opening crawl: "Turmoil has engulfed the Galactic Republic. The taxation of trade routes to outlying star system is in dispute. Hoping to resolve the matter with a blockade of deadly battleships, the greedy Trade Federation has stopped all shipping to the small planet of Naboo. While the Congress of the Republic endlessly debates this alarming chain of events, the Supreme Chancellor has secretly dispatched two Jedi Knights, the guardians of peace and justice in the galaxy, to settle the conflict..."
The 2011 Blu-ray release has significant changes. 1) The Jedi Speed Force has been altered to a more realistic speed effect. 2) Nute Gunray and Rune Haako observing the Jedi fleeing from the droideka on a viewscreen has been changed to a new and wide shot. It also features a new digital effect for the screen itself. 3) The pink tint in the whole movie has been removed to make it more natural. 4) Almost all scenes shows more of the image. 5) The grainy look in some shots have been cleared.